Most supermarkets in Dubai/UAE have a separate section, which has signboard at the entrance entitled ‘For Non Muslims’. MB is back in his adopted hometown of Dubai, United Arab Emirates. It’s good to be back. Earlier this week MB bought pork sausages and sliced bacon (‘rashers’ as they are referred to back in the Irish homeland) which has been an impossibility for the last two years in Saudi Arabia, as all pork products are strictly forbidden under Sharia religious law – haram! MB once brought in a family 6-packet of potato crisps (or ‘chips’ as they are referred to out here) – bacon flavour – into Saudi through Riyadh airport, forgetting that he had them in his suitcase, having just returned from Ireland. Thankfully the police/security guys at the airport did not open MB’s bags and he just sailed through with the contraband intact. Thus avoiding a confrontation that would most certainly have resulted in a final scoreline of Security Police 1 – MB 0. On informing a Young Muslim friend that MB was in possession of such illicit substance, young Muslim lad’s eyes glazed over at the thought of tasting forbidden fruit. Young Muslim lad (let’s call him Adam, from that Bible story) asked demanded that MB hand over a prized packet of the product, which is more rare than a synagogue in Saudi. But in the end, having spent a few days gazing lustfully at the contraband in the privacy of his apartment bedroom (before hiding them in a drawer each night lest one of his flat mates discover his crime) Adam’s religious upbringing & beliefs won out and he decided that he would just keep the packet for display, just to gaze at from time to time, wonder about the taste, and not actually consume the contents. However, upon MB’s inspection of the crisp bags it clearly stated that the product was/is suitable for vegetarians. But how could that be wondered MB, if the crisps had bacon meat flavouring. So MB turned to his friend Mr Google for some advice. ‘Eureka’ screamed Mr Google from the high res screen on MB’s MacBook Pro. All bacon flavoured crisps the world over are actually flavoured with a chemical flavouring agent, so they only taste like bacon, but have no actual real bacon content. And are therefore suitable for vegetarians. This is what religion does to people – makes them wonder what flavour crisps God likes! MB guesses the guy has a point. Muslims & Jews can not eat pork meat and Hindus will not eat meat from cattle or horses. Presumably other religions also have their own versions of the rule. But MB digresses. Back to Adam and the crisps. Upon reading some further web comments, and consulting a friend on the matter, Adam was swayed on the argument of ‘What if?’. 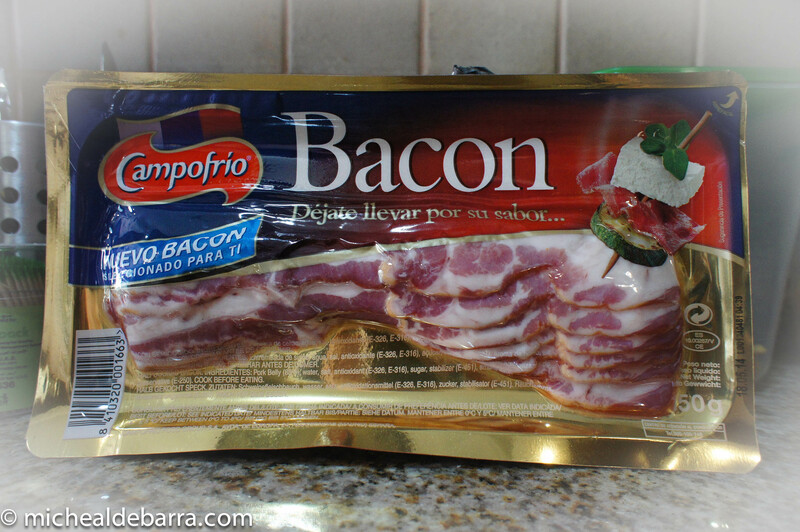 What if tasting the bacon chemical flavoured crisps (free from sin) gave young Adam a liking for bacon flavoured anything, and this could then lead to his desire for the real thing – actual real bacon. And thus lose his soul in the process and suffer everlasting damnation in the Islamic hell fires. Bit like the ‘soft drugs’ leading later to ‘hard drugs’ theory. So that’s where the story ends as far as MB is aware. Adam still removes the crisp packet from the drawer now and again to gaze and wonder. But he is content in his wondering. And has no actual desire to open the packet. So his place in heaven is assured and who knows what will happen to the crisp packet when he eventually passes away. A dilemma for young Adam to address at some future point. MB will be long gone by that stage and if both MB & Adam end up in the same 5 Star in heaven they can resume the conversation again about the forbidden taste and the ‘what if?’ And maybe by that stage, God will also have confirmed what her preference actually is! Send this to the New Yorker magazine. Well written, Head Boy. Thanks Craig. Just write for a bit of amusement on Fridays out here in ME, our (holy) day off. And just because you suggested, I will send it to the NY and await the reaction. They must receive piles of rubbish every week so I guess a little more won’t hurt! Cheers. Thank you Adam. But lets just keep it to Adam – for your safe keeping! Cheers Brid. Try some crisps in lieu of the meat! If you ever come across maple-flavored bacon, don’t pass on the chance to try it out; if God’s got a favorite flavor-profile, that’s most certainly it! Thanks Gypsy. Let’s meet up in the hereafter and discuss God’s official response. Can’t wait! Cheers Mike, you got an official laugh out loud this morning while I read a few blogs. Keep up the hard work! Cheers Kev. The HX blog aims to please. And keep the paying punters smiling!